My dad has always told us that the best way to show love to your children, is to love their mother. I think this obviously goes both ways, so it is important for wives to show love to their husbands too! As a mom, it is really easy to focus on my kids (who are very demanding of my time and attention), but at the end of a long day sometimes the last thing I want to do is then shift gears to talk to anyone else- even if that other person is my spouse. The workshop was a great reminder of things that I can (and should) be doing daily to make my marriage thrive. I also think that many of these reminders allow us as parents to help teach our children so many important things- such an unselfishness, kindness, and dedication. 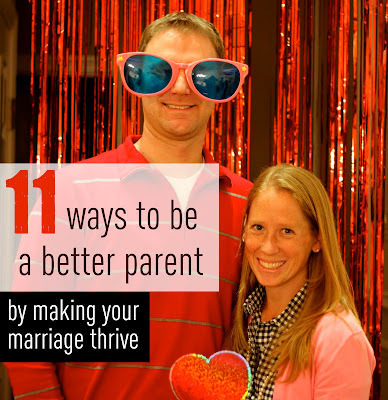 Today I'm going to share 11 ways for making your marriage thrive... and then add in how I think they can also help me to become a better parent. I would love to hear your tips regarding how you work to make your marriage thrive in the comments below, so definitely share them! 1. Start over each day with a determination to make your marriage great! Some days are just hard. As a couple I think it is awesome if you can start over with a clean slate each day and recommit yourself to making your marriage fabulous. This requires letting go of grudges and forgiving and forgetting (and not bringing up sore subjects over and over again). I also love to teach the same concept to my kids. If we have a bad day, we talk about how tomorrow we're going to have a do-over and make things better the next day. I have to resist the urge to bring up past events and instead focus on the positive things ahead! 2. Family time is not couple time. Make time just to spend with your spouse. Spending time with your spouse doesn't mean you have to go out or spend money, but it does mean that you plan specific things to do together that allow you to build on your relationship as a couple. We have been attempting to go on date nights out a few nights a month. Sometimes we go on double dates with other couples, and sometimes we go out alone. We also try and go on a little getaway every year for our anniversary. It is fun to reconnect, have time for uninterrupted conversations, and even talk about our goals/dreams as a couple and family. I think it is important for our kids to see that we take time for one another. I also try and do special dates with our kids each month. I think this teaches our kids that each member of our family is important and deserves special attention. 2. Schedule your date with your spouse first (and schedule the rest of your time around it). We are working on being better about this. I think most people would agree that life gets in the way sometimes. I think there are definitely seasons of life when we are busier or more tired as parents, so scheduling a date is hard. If that is the case with you, redefine what a "date" is and make it fit your needs. Quality time as a couple can look different in every family. My favorite thing to do with my husband is to sit at the kitchen table while he makes us a late night treat- carmelitas or peanut butter bars. I am always amazed at how much better of a parenting team we are when we have 1:1 time together to just have fun together (and eat our treats). 3. Sit down with your spouse and ask, "What can I do for you to make you feel loved?" Have your spouse ask you the same question. This was a suggestion from the workshop that we haven't done yet. It reminds me of the book The Five Love Languages of Children. Everyone has a different love language, so talking with your spouse about this can't help but yield positive results. As parents I think this is a little harder, because our kids won't often spell it out, yet oftentimes their behaviors will tell us how they want to be loved/shown love. I'm challenging myself to do this step this week! 4. Be a role model for your children of the type of partner they have the potential to become. I want my kids to have amazing marriages and I want them to be successful in their relationships with friends. Their success starts right in my home with how I treat my spouse. They will model themselves after my behavior. When I get angry too quickly, my son tends to get angry at friends quickly. When I am kind and patient, I see those behaviors reflected in his relationships. 5. Offer a sincere compliment, at least 3 times a day. Man, I need to be better at doing this one. Life is so much happier when we are looking for the positive things that others do. I notice that when I focus on the positive things my spouse does, I am happier, and then my kids are happier too. When I start focusing on the negative with my spouse, things just go downhill and I tend to start being negative with my kids too... which definitely makes me feel like I am failing as a parent! 6. Try something new... together. We tend to do the same old thing together. We watch shows, make treats, go out to dinner, and if we're lucky, we escape to a movie. On Saturday night we went on an amazing date that my friend created and it was such a fun change from the norm. I actually love routine, but I also think the idea of trying new things together helps keep things fun. I am always teaching my kids about the importance of trying new things, so doing this as a parent/couple definitely makes me feel less hypocritical. We are going to try and do this more often. I hate doing dishes with a passion. They are never-ending. My husband knows this and so we usually spend time together doing dishes on Sunday nights (when kids are occupied or asleep). We call it "family dish time." I love it. We really have a good time catching up with one another and then we start off the new week with a clean kitchen. Working together as a couple also reminds me how important it is for us to work together with our kids. So many good life skills are taught through work. 8. Be unselfish. You can't be selfish and have a fabulous marriage. As a parent, you really learn to be unselfish with your kids. They consume a lot of time and energy. Sometimes as a spouse I am selfish of my "alone" time or even silly things (like my treats), because I get tired of sharing with just one more person. As parents, my husband and I both need breaks from time to time. My husband has been amazingly unselfish this year and has watched our kids while I've gone on three different girls trips. I have come home rejuvenated and ready to be a better mom and wife. I love this article about selfishness in marriage. It has some good things to think through and ends with this great quote- “Being happily and successfully married is generally not so much a matter of marrying the right person as it is being the right person.” - Howard W. Hunter. Being unselfish as a spouse is a great way to teach your kids about being unselfish. They are always watching and learning from us. 9. Give 100 percent effort, not just 50 percent. My husband and I talked about this a lot when we were first married. If everyone tries to give 50% in marriage, but someone fails on that again and again, then you're never at 100%. If each person gives 100% (or even just 80%), then your relationship is always operating on a surplus... especially on a week where one partner is struggling and can only give 30%. There are some weeks when we just go through the motions and are like passing ships in the night with busy schedules. Leaving nice notes in shoes, buying each other special treats, or even just sending a sweet text during the day are simple ways to still be nurturing your relationship during those times that are crazy or tough! 10. Learn to be happy with yourself. The happier you are with yourself, the more you bring to the relationship. I think everyone has different needs related to how they stay happy and feel centered. For me I need to be exercising, praying, increasing my spirituality, spending time with friends/family, and learning something new. Sometimes I can do these things with my spouse, sometimes I need to do them alone. When I am happy with myself, I am also a happier parent. I compliment my kids, do fun activities with them, I am patient, and I am less selfish. I don't feel this way every day... but when I do, it is awesome! 11. Get help if you need it! Some couples do need to see a therapist when they are struggling. Often couples wait too long to get help. One thing that our workshop mentioned is that marital problems are sometimes signals that a couple needs to learn new skills to create a happy relationship. These problems don't necessarily mean the couple needs to separate or divorce. Each couple is different and has different challenges. I think it is important to recognize that sometimes we need to ask for help. Help can come from a therapist, another couple you trust, supportive parents, or other resources like marriage classes and books. Recognizing that you need help and being willing to ask for it is a great skill to demonstrate to your kids. Everyone needs help at some point during their life. Wow! Can you tell I learned a lot of great things the other night? Did any of these tips ring true to you? How do you work to make your marriage (or relationships) thrive? Do you think having a successful relationship as a couple impacts how you parent? How? I would love to learn from your experience and wisdom. We haven't been married for that long, so I'm sure some of you experienced parents/couples have some great advice for me! Pass it along in the comments! PS- Do you think my husband is going to kill me for posting this photo of us at the top of this post? :) Doesn't he look adorable? I loved reading this I think that it is all true!!! Thank you for posting it. Thank you for your sharing your thoughts. Great post! Sometimes with kids, it is hard to remember to nurture the original relationship that created the kids ;) My husband and I have made it a priority for 2012. Hey Kristy....my husband and I will be celebrating our 44th wedding anniversary next week and all of the things you mentioned are so spot on. My biggest suggestion is TALK TO EACH other!!!! I think this is so huge. With both parents working full time it's hard to find time to talk. We used to go just down the street to a little restaurant and sit there for hours over coffee. No phones, no tv, no kids....no interruptions. Talk about everything and don't hold things in for so long that an itty bitty irritant turns into a full blown problem. If you don't have money for a baby sitter then turn off the tv after the kids go to bed, turn off the cell phones, make a pot of coffee or pour yourselves a soda and sit in your kitchen and TALK! 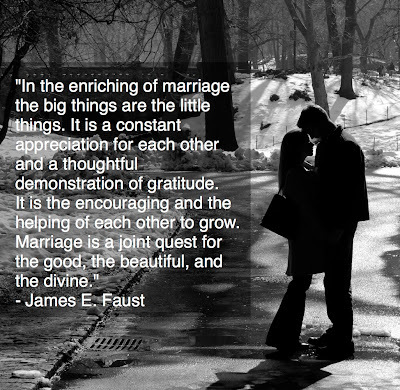 A good marriage doesn't just happen...you both have to work on almost every single day. And just when you think you have it figured out, circumstances change everything, times in life change everything. But after 44 years I can still honestly say that I am married to my best friend and life together just keeps getting better despite the money problems and health problems. We have each other....we have it all. Wishing all of you the same. Kate- Thank you! What great advice!! I agree that needs to be a daily effort. Congratulations on your upcoming anniversary! This couldn't have come to me at a better time. As I feel broken and defeated. Thank you from them bottom of my heart. This breaks my heart. I am glad I decided to post it then. It isn't something I typically share on here. You know the one on here that rings the strongest with me? #3. What a beautiful thing to say to one another. Maybe not on a daily basis, but surely on a weekly or monthly. It's just a beautiful, non threatening, way of saying, "I love you, I want us to work, what can I do to make that happen?" I feel so bad that you are feeling broken and defeated. I hope it's one of those little bumps in the road that we all run into, and not a mountain too high to climb. Best of luck to you, Anonymous. What great tips. It is so easy to put the relationship with your spouse on the back burner, and focus on the children, the job, the tasks of daily life. Reading this has given me some great ideas for fostering the most important relationship... the one with the man I love. wonderful post. My husband works a lot and there are days when we don't even get to see each other - so staying connected is hard to say the least. I need to work on this list and introduce some of this into our home. Thank you for sharing. Great list! I completely agree with #11. We had to go to marriage counseling awhile back and it made a world of difference for us. It's not a cure as we have to keep working at our marriage and remind each other to keep using the strategies we learned bc it's easy to fall back into bad habits. What great advice. I truly believe the best gift we can give our children is a healthy marriage and make for a great home environment. Thanks for this reminder! Very nice post! I read it last night and sent the link to my husband and said I thought this was interesting and asked him to read it. He spent literally 5-10 seconds and skimmed the page & said, Okay, so what? Which caused a tiny argument between us and I stormed out of the room thinking he just didn't care! Well... 10 minutes later he comes in to talk to me. Explained that when he first saw this article, he became defensive & non-receptive. He thought this was my way of saying he was a bad parent/husband (which wasn't the case at all!) He is great! But even good marriages could use tips on maintaining their greatness! So just an extra tip to everyone... make sure your spouse understands what your trying to say when you bring up any kind of helpful marriage tips! I think we will have a lot of fun planning our dates & following some of the other tips from this post. When we moved away from family, we found it particularly difficult to get out together. So recently we started having "date night-in". We feed the kids a simple meal, and then after they go to bed we share a simple meal of crackers and cheese, olives, etc., and some wine. By doing this, I am not exhausted from meal prep and clean-up, and have some energy left for talking and connecting. We even share from the same plate of food, which causes us to face one another while talking. It has been great for us! I am about two weeks away from having our first child! These will be great to keep in mind to keep our wonderful marriage staying wonderful! This was such a great article to read! Kristina....my husband and I are newlyweds and expecting our first child actually right around our 1st anniversary. :) and this is definitely something I want to share with him and try to work into our daily lives....great tips & advice and being able to have your own personal experiences with the guidelines definitely makes me feel like we are not the only couple having some of the same experiences. Thank you so much for sharing! Great tips. DH and I have been on the verge of separation before... We thought our relationships was just broken but it turns out we had both been stressed for years because of our high needs son. It had been going on for so long though we were so disconnected and neither of our needs were being met. Things are a million times better now that we've figured out how to parent our son. :) still trying to figure out how to squeeze in enough time for each other but its much easier now that we actually want to spend time together. Very nice post! Thank you for your sharing your thoughts. Excellent advice and well needed. We have a 19 year old and now a two-month old, so we are starting all over. It seems harder to find the time to spend on each other. The other day I said to him "I'm still here" because I was feeling a little neglected and he replied "I'm still here too." It was the first time that I realized that he was feeling a little neglected also. This advice is especially helpful to us. My kids are doomed in their marriages. I wish I could have known what I needed in a husband when I got married. Kristina. You're so encouraging. I definitely needed to hear this so much. It's definitely need easy raising kids let alone four! Marriage can easily be put on the back burner and your focus is only on your kids or their activities. I love the compliments idea! I will try it!